While I did stay up too late finishing my last book, I did it again with this book - because I really, really had to! I feel I was more invested in the characters and not just the plot in this one. 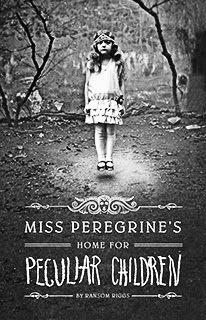 I finished my sixth book this year - Miss Peregrine's Home for Peculiar Children by Ransom Riggs - to satisfy the requirements of number 22 on the list, a book that scares you. While in retrospect the book wasn't especially scary, I was worried about reading it late at night (when I usually read) while I was the only one in the room. But once I got into it, I just couldn't stop. The book is about a boy who thinks he is going crazy about the circumstances surrounding his grandfather's life and death. In order to prove his sanity, he goes on a research trip to find out the truth about his grandfather's history. I'm thrilled that there's more. The second book, Hollow City, is already out, and a third is due to release in September. I'd highly recommend this series to anyone who enjoys great characters and a bit of fantasy.